From the mid-90's to the early-2000s, Paris was mostly silent. Yeah, he put out Unleashed, but that was hardly a full-fledged solo outing. 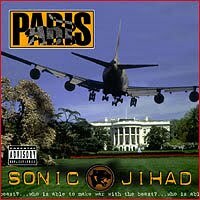 After the events of September 11, it wasn't like I was saying to myself, "the world needs Paris now more than ever," but when he popped up a couple years later with this record, it made perfect sense, and reminded me that I was indeed curious about what the dude had to say regarding recent events. 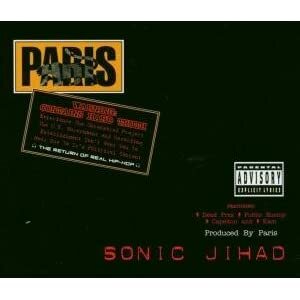 By the time this album dropped (October 2003), it obviously wasn't going to be quite as relevant as it would have been a few years earlier, but you can tell from the cover that Paris was still interested in getting some play out of the still-sensitive issue. (However, when the album shipped, it came in an all-black cardboard sleeve that featured a warning about the "hard truth" contained within. Sure, it was overly dramatic, but it was a good move in my book.) And rather than rush something out, he took his time with this thing, and it ended up being a great record. Saying that it's his strongest since Sleeping With the Enemy isn't saying much, but it was. And more importantly, it proved that dude still had what it takes. If you thought P-Dog hated the first President named Bush, it quickly becomes apparent that he still had some ire in reserves for his offspring. And rather than resort to the knee-jerk assassination barbs (though he does declare "The return of the Bush Killa" on the first track), he takes the time over the course of this record to deconstruct the then-current presidency piece-by-piece, while also tackling news organizations, pundit-minded celebrities (the Dennis Miller diss was unexpected), religion, the military - you get the idea. In the end, this album is more a return to form than a mind-blowing reinvention, and that's why I like it. It almost comes across as an updated version of Sleeping With the Enemy, and while that might be a bad thing for some, it's fine by me. After feeling like I knew what to expect from Paris and then being thrown the curveball that was Guerrilla Funk, I realized that all I really wanted him to do was come back with some hard raps, dark beats, and a chip on his shoulder the size of the Golden Gate Bridge. And he did it.